It’s weird to think that Google Chrome has been with us for a decade, but the free web browser celebrated its 10th birthday on September 2, and fittingly, has released a flashy new update to reflect its new-found maturity. 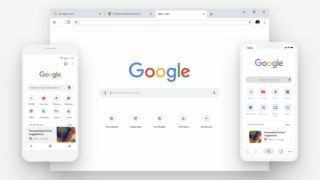 Although Google updates Chrome every six weeks, this one’s a little bit special, with a completely refreshed look for the browser, including rounded shapes, a fresh color palette, and new icons. The new look uses a flat design that does away with shadows and gradients, giving Chrome a cleaner, more streamlined appearance, which makes it easier to navigate quickly. Tabs have been given a rounded shape, making it easier to see the icons for each website when you have lots of tabs open. Aside from these aesthetic changes, Google has also upgraded its search bar to show answers to your queries in the bar itself - meaning you can get quick answers to your questions without having to open a new tab. You will also be able to search for tabs within the search bar, which again is handy if you work with lots of tabs open at the same time. As well as that, you can now set your favorite sites on the ‘new tab’ page, and set a background image of your choice. Google also announced that you will soon be able to search through your Google Drive files and folders using the search bar, but perhaps the most exciting update is the one it’s made to its Dino Runner game. If you’ve ever had a bad connection you may be familiar with the pixelated T-Rex, which launches into a side scrolling game if you hit the spacebar. In celebration of Google Chrome’s tenth year, the game has been refreshed with birthday cakes and balloons, plus the T-Rex has been kitted out with a cute party hat.